Winter craft projects can be inspired by simple household materials, such as soup cans and quilting batting. If your idea is to make a snowman, you can put these two basic supplies together to create a snowman that stands up on its own and can be set on the holiday mantel or hung by wire on a Christmas tree. Quilting batting is an effective material because the fluffiness and white color give off an impression of snow, which is what you want for covering the tin can. Place a piece of quilting batting on the working surface. Lay the soup can flat on its side, on top of the batting. 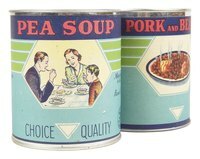 Roll the soup can in the batting for one full turn, or until you come to a point where the entire can is covered in the batting. Mark the area with a fabric pen where the can becomes fully covered by the batting. Use a fabric pen because the dye from the pen will not bleed and run on the batting fabric. Use scissors to cut out the batting so that it fits around the soup can. Cover the sides of the soup can in craft glue. Press the batting over the glue to cover the sides of the can in the snowy white material. The batting will fit around the can, but may stick up at the top, depending on how long your sheet of batting is. Use scissors to cut the excess batting off the top of the soup can. The top of the batting should be flush with the top of the soup can. Set a small plastic foam ball onto a scrap piece of the batting. Roll the ball in the batting and cut the batting at the points where the ball becomes fully covered in the fabric. The small ball symbolizes the snowman's head. Glue the quilting batting onto the small plastic foam ball. Glue the underside of the ball -- the side where the edges of the batting are glued together -- on top of the flat surface on the soup can. Now the snowman has a soup can body with a plastic foam ball head. Design the snowman's accessories out of colorful felt scraps. Make a red scarf by drawing a long rectangle in red felt, cutting it out and gluing it between the small plastic ball and the soup can -- allowing the scarf's ends to dangle down. You can also use black felt to create tiny circles that look like coal, and glue them up the snowman's body. Another idea is to draw a pair of mittens in black or red felt, cut them out and glue them to the sides of the soup can to make it look like the snowman has hands.